King Kong vs. Godzilla: The Battle of the Monsters! Before there was Alien vs. Predator, before there was Freddy vs. Jason, before there was The Avengers, there was King Kong vs. Godzilla. If you have read my blog before, you probably know I’m a pretty big Godzilla fan. I spent most of my childhood (from ages 8 to 11) buying Godzilla movies. None of them are great or anything like that or revolutionary in special effects, but they’re all pretty fun to watch (the 1998 Godzilla film doesn’t count). King Kong, on the other hand, is actually a great movie (the 1933 version). Sure it has a B-movie story, but its special effects have made the film a landmark in cinema. The movie is full of iconic scenes, such as the Empire State Building fight, and one of the most beloved in history. King Kong vs. Godzilla was done by ToHo Pictures, which makes the Godzilla films, so it is more like a Godzilla movie than the original King Kong. All I was expecting from King Kong vs. Godzilla was to be entertained, and it did so. The movie’s plot is pretty much an excuse to get these two monsters to duke it out, but I’ll explain it anyway. A nuclear submarine headed by the UN hits an iceberg, which unfortunately Godzilla was frozen in. Godzilla is released from his icy prison and wreaks havoc on Japan. Meanwhile, a group of explorers go to a mysterious island and discover King Kong. They bring back Kong to Japan, who escapes and runs across the country. You know what’s going to happen next. 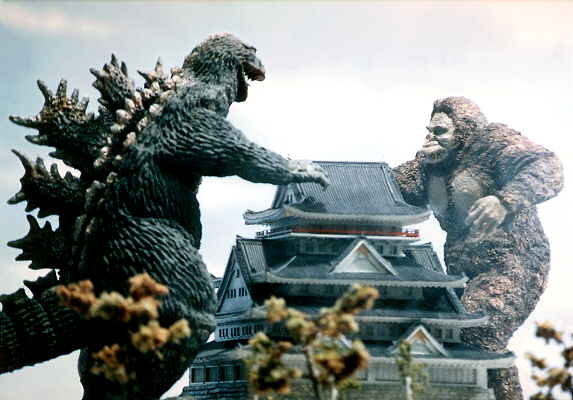 Eventually King Kong meets Godzilla and both monsters battle each other on a miniature set. It’s impossible to take any Godzilla movie seriously (the original is an exception), and it’s easy to point out the many flaws of King Kong vs. Godzilla. The special effects are absolutely dreadful (though made 20 years earlier, the original King Kong is far more advanced). The two monsters wear very fake-looking costumes that you can see the edge of King Kong’s mask. The movie also employs a green screen which gives a blur around the characters. The miniature sets don’t even look very realistic, and when one of the monsters destroys a building, all you can see are bits of cardboard. The dialogue is absolutely terrible, and like Godzilla: King of the Monsters, some parts were added from the original Japanese version that feel awkwardly placed. But that’s all part of the appeal of the Godzilla films. I enjoyed watching King Kong vs. Godzilla, though it is a pretty bad movie. I felt that about four fifths of the films was just leading up to the battle scene, but it was worth it. Nice review – love this film and like you say, the plot is all just about creating an excuse to have a couple of monsters to battle it out in a great, but awful in terms of special effects, final battle scene. A bad film, but one that is so very worth it. I’m glad you enjoyed it too! The Godzilla films are all pretty bad, but they’re always fun to watch. I love this movie. I like reading your write ups. Good review. Thanks! Definitely a cult classic!